Logan and I awoke early Sunday morning in our tent staked at the Mt St Helens' parking lot, Climbers Bivouac. 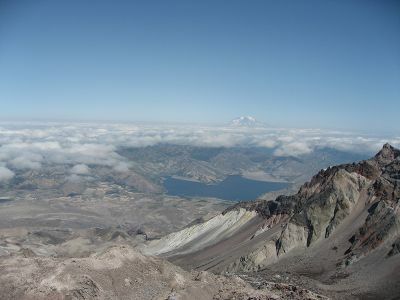 We ate a hot, hearty breakfast, prepared our gear, stretched, and hit the trail for our second time up to the crater rim. We reached the summit with at least 20 others in an emotionally gratifying moment. One couple was away from the others staring at the landscape in silence. A larger group brought a dozen unique bottles of regional micro brews to share tastes with others via tiny liquid medication sized cups. I removed my pack to search for our lunch. I gave the camera to Logan and suggested that she, "Take some pictures.". 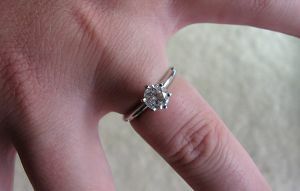 While she was distracted, I dug for the ring that had settled to the bottom of the pack. I was already conveniently down on one knee and presented the ring. I waited the few seconds it took for Logan to focus her attention on me. I spoke, "Logan, love of my life, will you marry me?". Before Logan could answer, a beer drinker was smacking one of her friends while asking, with a suspecting tone, "Do you see what is going on over there? They just got engaged!" I steadied Logan's legs as her back happended to be towards the crater and she was speechless, let alone able to hold her balance. I informed her, "You haven't answered my question." Of course, she said yes and we put the ring on her finger. 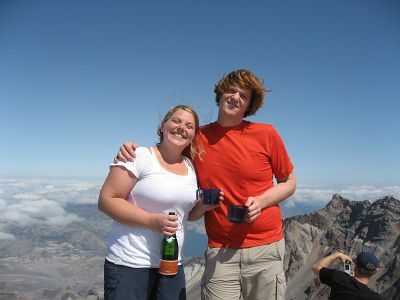 My next surprise was unveiled as a 3.5lb bottle of champagne I hauled the 4,500 vertical feet that we now could enjoy. It was worth it!